Base blogging service LiveJournal to raise the TCI, SEO promotion of their projects through earnings Blogun.ru, Setlinks.ru and direct sale of links / articles. Also in the archive includes a detailed manual, which consists of 11 sections, which are painted methods for creating, configuring, filling LiveJournal blog + monetization methods, as well as a bonus consisting of 153 free Learn names with TCI greater than 0. 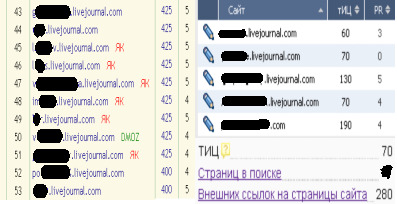 LiveJournal - a powerful tool that has an incredible trust in the eyes of search engine Yandex. Really working method + standing base of nearly 4,000 sites, divided and sorted into TCI. Results: +70 40 TCI TCI for the first update. I, Cttr (Vladimir) - the author of this guide, as well as the collector base LJ blogs. The method requires a head on his shoulders and time-consuming, thus giving a stable income, the amount of it depends only on you. After updates TIC, PR sending a new version of the database LiveJournal blogs (if you wish, please specify the email). Good luck in your endeavors!